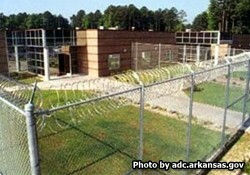 Randall L. Williams Correctional Facility is located in Jefferson County Arkansas. The facility has the capacity to house almost 500 inmates. Inmates at this facility can take education courses including classes to earn a GED. Offenders can also receive substance abuse education and treatment. Inmates can participate in a regional maintenance program as well as the Paws in prison program which allows inmates to work with animals. Visiting is on Saturdays and Sundays from 11:30am-3:30pm, you must contact the inmate prior to visiting to see which day they are allowed. Visitation is on an alternating schedule and can change frequently.